Righteous Philaret the Merciful, son of George and Anna, was raised in piety and the fear of God. He lived during the eighth century in the village of Amnia in the Paphlagonian district of Asia Minor. His wife, Theoseba, was from a rich and illustrious family, and they had three children: a son John, and … Συνεχίστε να διαβάζετε Righteous Philaret the Merciful of Amnia in Asia Minor. The Greek Orthodox monastery of the God-trodden Mount Sinai is located at the very place where God appeared to Moses in the Burning Bush, beneath the Mount of the Decalogue. In the providence of God, it is at this site also that the holy relics of Saint Catherine are enshrined. This is the oldest continuously … Συνεχίστε να διαβάζετε Mount Sinai Monastery. The Holy Great Martyr Catherine was the daughter of Constus, the governor of Alexandrian Egypt during the reign of the emperor Maximian (305-313). Living in the capital, the center of Hellenistic knowledge, and possessed of a rare beauty and intellect, Catherine received an excellent education, studying the works of the greatest philosophers and teachers of … Συνεχίστε να διαβάζετε Great Martyr Catherine of Alexandria. Saint John Chrysostom, Archbishop of Constantinople, one of the Three Hierarchs [January 30], was born at Antioch in about the year 347 into the family of a military commander. His father, Secundus, died soon after the birth of his son. His mother, Anthusa, widowed at twenty years of age, did not seek to remarry but … Συνεχίστε να διαβάζετε St. John Chrysostom the Archbishop of Constantinople. The Martyr Anastasia the Roman lost her parents in infancy, and was then taken to be reared by the abbess of a women’s monastery, named Sophia. She raised Anastasia in fervent faith, in the fear of God and obedience. The persecution against Christians by the emperor Decius (249-251) began at that time. 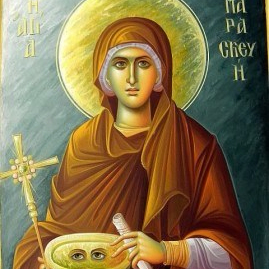 The city administrator, … Συνεχίστε να διαβάζετε Martyr Anastasia the Roman. The Great Martyr Demetrius the Myrrh-gusher of Thessalonica was the son of a Roman proconsul in Thessalonica. Three centuries had elapsed and Roman paganism, spiritually shattered and defeated by the multitude of martyrs and confessors of the Savior, intensified its persecutions. The parents of Saint Demetrius were secretly Christians, and he was baptized and raised … Συνεχίστε να διαβάζετε Holy, Glorious Demetrius the Myrrh-gusher of Thessalonica. The Seven Youths of Ephesus: Maximilian, Iamblicus, Martinian, John, Dionysius, Exacustodianus (Constantine) and Antoninus, lived in the third century. Saint Maximilian was the son of the Ephesus city administrator, and the other six youths were sons of illustrious citizens of Ephesus. The youths were friends from childhood, and all were in military service together. When … Συνεχίστε να διαβάζετε 7 Holy Youths “Seven Sleepers” of Ephesus.